Patrick McKenzie, probably better known to many of you as patio11, has been involved in countless projects across the internet. Patrick launched Appointment Reminder [AR] in December of 2010, describing it to a friend as “a boring problem space, but a great business.” Over the years it has grown, but the process has been a slog to him because it doesn’t solve an exciting problem or present any new challenges. By his own admission, this caused him to take a very lackadaisical approach to marketing the product. 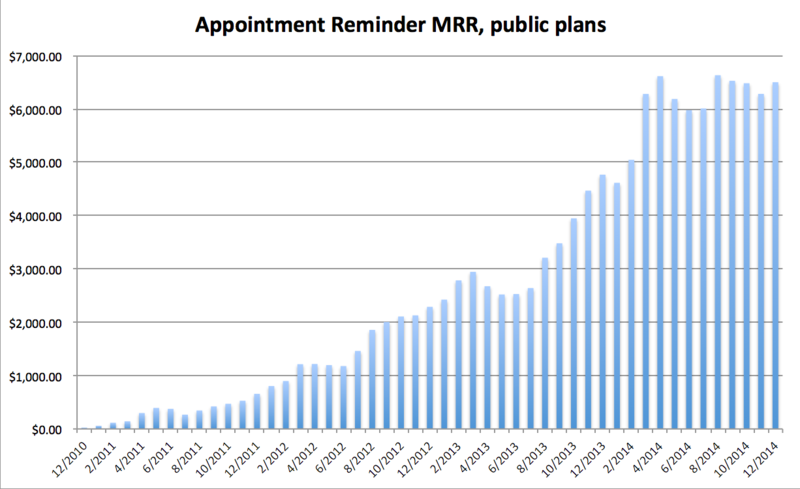 As of December 2014, AR was at a $6,500 monthly run rate [MRR], a growth of 35% over the previous year. Not bad at all for a side project! While growth has been steady and his numbers are respectable, his business has fallen short of the original goals he set out for it. In October of 2014, right around when his daughter was born, Patrick decided to give AR his full attention, get it to a happy point, and then decide whether or not to continue on, or spin it off to somebody and sell the business. After a few bursts of productivity, Patrick was able lay the groundwork needed for these changes and began ramping up a part-time sales person to help take over the bulk of the ongoing effort. In a January 2015 episode of his podcast, he set a goal of growing AR’s publicly available plans for $6,500 to $15,000 MRR by the middle of the year. In March, however, he announced his key involvement in a new startup, Starfighter, which aims to destroy the technical interview, limiting his time even more [if that was at all possible]. He has done the hard part of systematizing his lower touch sales process, now he just needs to increase his traffic in order to take AR to The Next Level [TM]. This guide identifies how things are now, and then lays out a plan for how Patrick can go forward from here and leverage the systems he put in place to reach his goal of more than doubling his MRR, without creating yet another full time job for himself. The AR website reaches out to anybody that runs “a professional or personal services business.” Big market, right? The problem is that this is too big of a market. The more people you try to speak to, the fewer you are able to connect with. Imagine you own a restaurant and are asking around for good leads on who could do that for you. One person introduces themselves as a “WordPress freelancer,” while another says their job is to “make beautiful websites for restaurants” and has a portfolio of clients just like you. Who are you going to go with? The specialist, of course, even if they cost more, because you know they understand you, your business, and your specific needs, lowering their perceived risk. By not making a stronger connection with any of his visitors, Patrick is going to lose a significant portion of them because they aren’t convinced AR will work for their needs. While he does mention several potential customers; massage therapists, salons, and law firms, he has since learned that personal service businesses are not the ideal customer for AR. Their price points are too low, and nobody is usually accountable for actually making sure clients show up. With this in mind, he raised his base plan from $29/mo to $99/mo to exclude those types of customers, so his copy should reflect that. Early on, he did create landing pages for the segments he thought we be core to AR; attorneys, beauty salons, electricians, hair salons, investment advisors, and massage therapists. The problem is that these landing pages seem primarily built for SEO purposes [i.e. just to rank for those terms], and don’t do a great job speaking to the average customer from each of those industries. And as mentioned with the home page, many of these customers are not who AR is targeting after their recent price increases. AR’s growth is completely dependent on organic traffic from search engines, and word of mouth referrals. Growth via word of mouth and organic traffic make up the dreams of every bootstrapper because they can be very powerful, but most importantly, they are free. The problem is that without a strong “viral coefficient” [as the cool kids are calling it], word of mouth leads to slow, albeit steady, growth. And to be honest, AR doesn’t quite have the same appeal as Slack does in that regard. On the point of organic traffic, Patrick isn’t looking for rocket ship growth to land a big VC round, but he trying to double his business in 6 months. The problem is, when he already ranks #1 for all of the major keywords, there just isn’t that kind of growth remaining. Note: This is nothing that Patrick doesn’t already know. He has been preaching this stuff for years, and helping businesses do just that with his consulting. It is more a case of the cobbler’s children having no shoes; after doing it for so long for everybody else, doing it all over again for his own business is one of the last things he wants to do. Especially when there are so many other things going on in his life, like fatherhood. The homepage is where most of the organic traffic is going to end up, so you can’t make it too specialized. The page should use language that most customers can relate to and “Fix Your No Show Problem” does a great job of that, so no changes needed there. Beyond that, Patrick should include testimonials from customers across the key industries he is targeting and include links to landing pages where those readers can go to learn more about how AR can help their specific business. After more than 4 years in business, Patrick has worked with clients from all sorts of industries. Not only does he know the unique problems each industry faces, but he knows the exact language they use to describe those problems. Using the customer’s own words to describe their problems is one of the best ways you can connect with them because it shows that you understand them, their business, and the issues they face. These words should be front and center on the new landing pages. Patrick does a great job with this on the home page, but the landing pages should go even further. Trades professionals typically have to send technicians out to their client’s homes for appointments, something they call a truck roll. If the customer isn’t home when they show up, the business loses out on the cost of the gas, and the employee’s time, but most importantly, when this happens the client often will call back and reschedule, and if the business isn’t available then, they lose out on a very high dollar sale. For HVAC companies, this can mean losing thousands of dollars. Simply using their language on the landing page and letting them know you understand just how costly the problem is creates an immediate connection with the reader. AR has also saved customers a lot of money in each of these industries, a fact that should be front and center in all of the marketing material with real testimonials. Testimonials in general are great. They show a prospect that you have successfully worked with other people, lowering the perceived risk of them working with you. But showing them that you helped somebody in their own industry generate specific results gets them to bust out the credit card and ask how they can sign up. They don’t have to wonder if these results apply to them, because your other customers already showed them that they do. Video testimonials are ideal, even if low quality, but at the very least any testimonial should include a picture of the customer, the name of their business, along with a link to it. This makes the words on the page more relatable and authentic. Patrick should repeat this for process all industries where missed appointments are real hair-on-fire problems. Is this a lot of work? Yup! But the lifetime value for many of these customers is in the thousands of dollars. A one-time investment that continuously converts more of these customers is a small price to pay for the enormous return. AR now has a thorough, interactive onboarding and outreach process during the trial, but doesn’t have anything to actively convince people to actually sign up for the trial. Typically a free trial is pretty low friction, but AR requires a credit card in order to get started, which raises the bar a bit. Unlike many SaaS companies, they have real fixed costs associated with servicing an account, so requiring a credit card to filter out the tire-kickers is a good strategy. However, it also requires a bit more warming up in order to get a prospect to hand over their credit card number. To solve this, each landing page should have its own semi-custom email series that gets the prospect ready [and excited] to sign up for the trial. Patrick literally wrote the manual on lifecycle emails, so I won't pretend I am teaching him anything with this, but it should still give you a good idea of what is needed. When writing these emails, it is crucial to remember who the customer really is and what their needs are. Patrick isn’t typically selling software to the dentist. More than likely he is selling to the office manager who would otherwise be making the calls themselves. Office Manager Milly, as Patrick refers to her, should be the focus of all of your emails. AR makes her job easier, but she still may need somebody else’s approval, and they want to know that this will show an ROI. Milly may not know how to do that, so help her! This may sound like a lot of work, but most of the emails will only need small changes from industry to industry. The important part that needs to be unique is including a couple of emails that expand the landing page testimonials into more detailed case studies. The testimonials give you credibility, but by showing specifically how you fixed problems in another business that the reader likely also has, you strengthen your position even more. Remember though, not all segments have the same value, so don’t spend the same amount of time building out these emails for each landing page. For example, spend much more time on the various medical specialties than you would on pest control services. Patrick’s time is very limited, so if he can get 80% of the results by focusing on 20% of the segments, he should. Once the landing pages and emails are optimized to convert traffic into prospects, it’s time to start driving some of that traffic to them using paid ads. Most of AR’s competitors focus their advertising spend on AdWords, which is usually a great starting point for a B2B operation. But because Patrick’s SEO is so strong, the people who are searching for appointment reminder software are already finding him without him spending a cent. But what about the people who don’t know they even need appointment reminder software? This side of the equation is currently missing from AR’s marketing plan, and once it is figured out will give them access to a much, much larger audience than they currently reach, and LinkedIn is the perfect way to achieve this. LinkedIn has some great targeting features for ads, and because Patrick has such a strong customer persona with Office Manager Milly, he can really take advantage of what they have to offer. 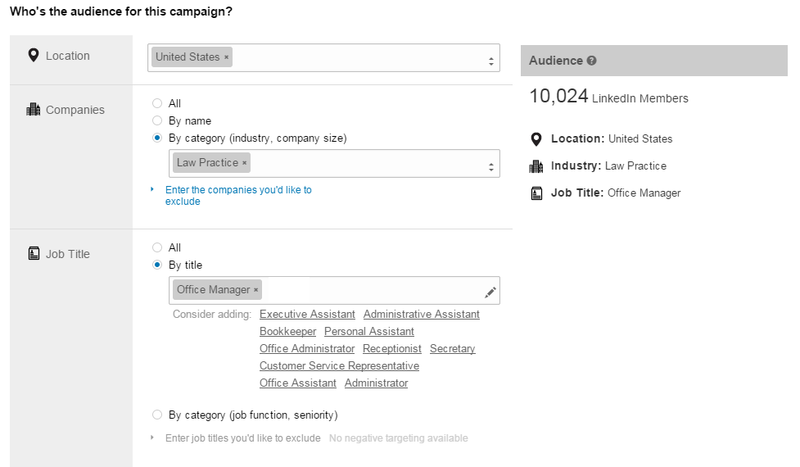 Unlike Facebook, LinkedIn lets you target specific groups so he could start by targeting a group like “HVAC Professionals” with 100,719 members. But remember, he doesn’t want all professionals, he wants Milly. No problem, he can do that easily. After setting up the ad creative, and the targeting to the US, it only takes a few more clicks to get a hyper-targeted audience. That’s it. This gives him 17,675 people who are the office manager of an accounting firm. That is almost 20,000 Millys to choose from in just one niche! If he repeats this with Law Practice Office Managers, he will get another 10,024. Medical Practice Office Managers add another 37,287. Sometimes you can’t get very precise with the company type, but to get around this you are able to layer different options on top of large groups to achieve a similar result. Trying to find Millys in the HVAC Professionals group mentioned earlier leaves him with an audience of 6,060. Are you starting to see how powerful this is? Setting up an ad doesn’t immediately create a money printing machine. Just like with anything, some trial and error is required. 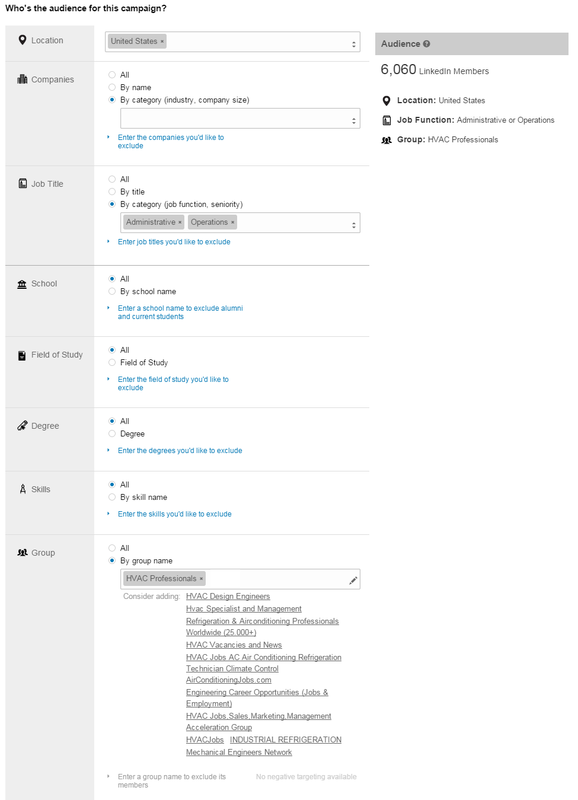 For any pay-per-click ad campaign like this one, there are two areas to test. The first is the ad itself. If nobody clicks on it, it doesn’t matter how good your landing page or lifecycle emails are. The picture is the most important part of any ad. Even the best copy fails if the picture doesn’t draw the user in. The copy is still important though, and should be tested as a second priority after the picture. The second area to test is the offer, meaning the promise you make to convince the user to click the ad. The easiest option would be to sell the benefits of the software directly, have the ad go to the landing page for the relevant industry, and then get the user to sign up for the email list. The problem is that sometimes this is too direct, so it is important to test other options like sending the user first to a dedicated landing page where they can download a white paper. There are an unlimited number of options to test here, but because the lifetime value of AR customers is so high, there is a lot of margin to work with. Even an underperforming ad could generate profitable leads, but that doesn’t mean optimization isn’t important. Another thing to note is that because sites like Facebook and LinkedIn target who a person is, the pool of people you can reach is relatively static over time. Unlike search engines which target whoever has a need at that time, which gives you an audience that changes more frequently. Because of this, the same people will see your ads over and over again, so you must update them regularly in order to get them to not be ignored. Patrick has already setup the processes to ensure all new leads are put into his CRM, and from there his part-time saleswoman ensures they are given the needed attention in order to close a high percent of them. With those systems in place, once the initial work of setting up the new landing pages and emails is done, all that remains is maintaining and optimizing the ad campaigns. Refining the ads until the turn a profit and updating them so they remain fresh does require work. But with the ability to precisely reach AR’s target customers who are worth thousands of dollars to the business, the time spent is more than worth it and will be instrumental in achieving the fast growth Patrick needs. Leaving him a clear path to reach or even exceed his goal of $15k MRR by the middle of 2015, without creating another full time job for himself.